There are lots of options for reading banis on the iPhone/iPad/iPod using various apps, however we wanted to let you know of a few more ways that you can read Gurbani on your "iDevice". The Bani formats on this page will work on any iDevice, however the benefit of these over using one of the Bani apps from iTunes store is that they will display much nicer on the large iPad screens and since they are just individual files you can use them in many different ways that an app would not allow. 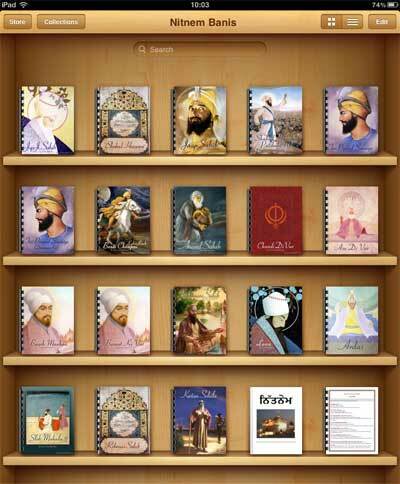 You can view any of the SikhNet Bani files on your device as is by just browsing and viewing the PDF files, however if you download the free iBooks app then you'll have more options and a place to store and organize your various nitnem files in a nice way. Then go to Safari web browser on your device and visit the Bani files on the eReader Page on your mobile device. When you click on a link to download a bani file, it will open in your web browser and in the top right corner you will see an option to "Open in iBooks", which will copy the PDF file to your iBooks app "shelf" and save it. As you download bani files and open in iBooks you will start to see the "shelf" fill up with the various banis and see the cover images. Now whenever you want to read a bani you can go straight to the iBook app. The bani files will be stored in a "PDFs" collection. If you already have other iBooks on your app you might see "books" button. Click on that to change to the "PDFs" collection. If you prefer, you can also create a new collection and call it "Banis", and then move the files over. This is useful if you keep lots of other non bani related PDFs in iBooks app. Another option is to download banis as an actual iBook. This is a single file in Gurmukhi (Unicode) with a table of contents that you can select a bani from and turn pages. The advantage of this version is that it is in a native eBook format (as apposed to PDF files which are not) and you can adjust the text size and use a few other features. It has smoother page turning, though we have noticed it is slow to load on start up or change the font size, and Unicode font for Gurmukhi is not as nice to read. However, overall looks great on the iPad with two page view!